Enough with the twisting of the 14th Amendment. We are going to break this down right now to clear things up. 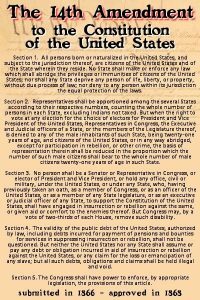 The 14th amendment was an amendment that had a very specific purpose and it was necessary after the Civil War as the nation was in the midst of reconstruction. Before the 14th amendment, an American citizen was defined by citizenship in one of the Sovereign Union States. If you were a citizen of a state, then you were considered an American citizen. After the Civil War, there had to be a way to recognize black Americans of African descent as American citizens. Otherwise, the southern states would continue to refuse citizenship recognition to the former slaves, because they would not acknowledge that they were citizens of the state. This makes the 14th Amendment very practical for doing what needed to be done. These were not slaves that were coming into the country and dropping babies after the fact to make their kids Americans. This is where your evil, dishonest media continues to brainwash the public, as they make the constitution whatever they want it to be, whenever they want it to fit their anti-American narrative. Without the 14th Amendment, the southern states could deny US citizenship by withholding state citizenship. 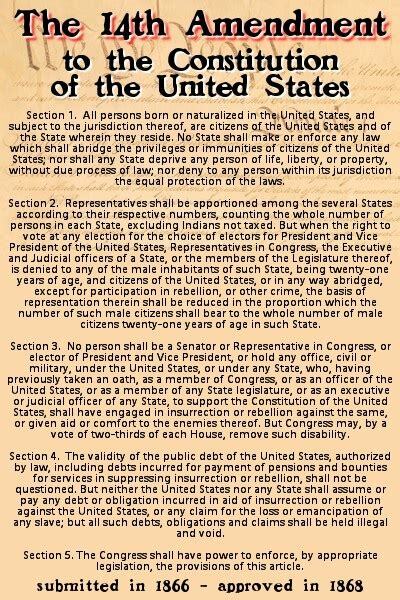 The Civil Rights Act of 1866, stated that, “All persons born in the United States and not subject to any foreign power, excluding Indians not taxed, are hereby declared to be citizens of the United States.” The 14th Amendment was intended to solidify the constitutionality of the Civil Rights Act, in order to prevent congress from repealing it through the legislative process. The constitutional amendment would require adherence to the amendment process if there was ever an intent to repeal, and that requires 2/3 vote in congress and ratification from the states. We still haven’t gotten to the part about foreigners sneaking into the country and giving birth to make their kids Americans. We won’t be getting to that part of the 14 amendment because, that part doesn’t exist. That’s right, it is a fabrication by the leftist radical media and political opportunists that seek to destroy America as we know it. Section 1 of the 14th Amendment states, all persons born or naturalized in the United States, and subject to the jurisdiction thereof, are citizens of the United States and of the State wherein they reside. No State shall make or enforce any law which shall abridge the privileges or immunities of citizens of the United States; nor shall any State deprive any person of life, liberty, or property, without due process of law; nor deny to any person within its jurisdiction the equal protection of the laws. Our dishonest media emphasizes the “all persons born”, as they ignore the “subject to the jurisdiction thereof”. Jurisdiction here does not refer to those that are subject to our laws or courts. In this instance it is referring to one’s allegiance to the country. This would include American values and principles of our government system and rule of law. The recognition of this Allegiance to America suggests that foreigners that are leaving one country to enter America, baby or no baby, have no allegiance to our country and they definitely don’t respect our rule of law, or coinciding values. There is no right to expatriation as the leftists in this country would have you believe with their manufactured, emotional plea for the “migrants” and this was never the intent. This will be decided in the United States Supreme Court, sooner rather than later because one must assume that there will be challenges to President Trump’s proposed Executive Order. The Only Supreme Court Case that has touched on this subject of birthright citizenship was United States v. Wong Kim Ark (1898) where birthright citizenship was handed vague recognition as it was given a common law definition via its ruling. The dissenting opinion in this case stated that The American Revolution that was the basis for the founding of America, and the founding fathers that took part, had rejected the concept of birthright citizenship, and that the idea was also denounced by those that authored the 14th amendment. However, there has never been a Supreme Court case that definitively legitimized or legalized this birthright status in regard to citizenship. It should also be noted, that congress had attempted to end birthright citizenship in 1997 but it ultimately failed due to political pressure, and opposition that gave in to that pressure. These are all facts, and the analysis that I have provided here should be seen and understood by every American. The deep state sponsored, radical leftists that are hell bent on ending America do not want people to be privy to this information, or have an understanding of the implications here. The deep state only wins when people are willfully ignorant, and uninterested in educating themselves. They cannot engage in debate or even conversation because they have no ideas, and they off no solutions. That is why they shout down opposing viewpoints. Keep an open mind, be a free thinker, don’t be a sheep.